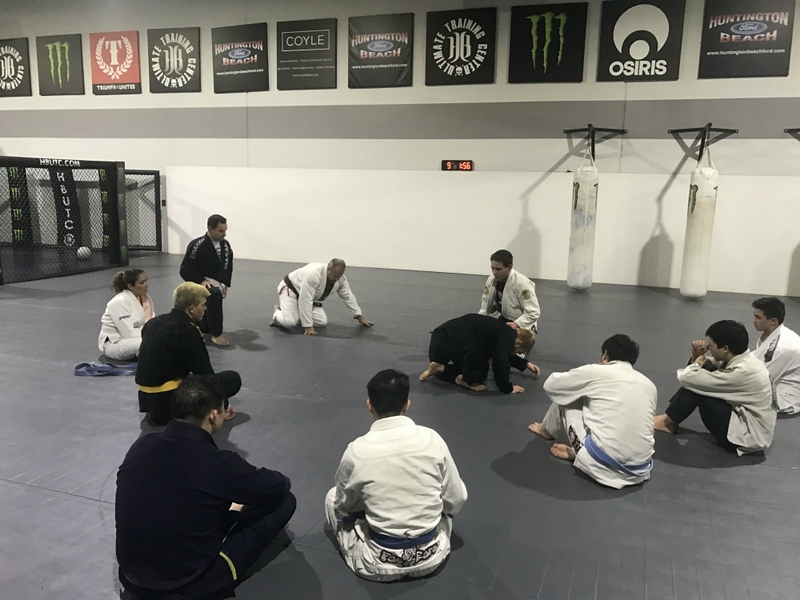 Huntington Beach Ultimate Training Center’s adult Jiu Jitsu program consists of beginner, fundamental, and advanced classes. Learning one of the worlds most efficient martial arts like anything else must first start with a strong foundation. Our beginners curriculum is where all new HB Ultimate Training center students start on their path to black belt. In each students first class the professor will discuss with them the art of jiu jitsu and the benefits of learning the gentle art. Within the students first 5 to 6 classes they will learn the ABC’s of Brazilian jiu jitsu. The beginner curriculum is 12 to 18 weeks longs (based on students progress) and will cover basics and essential techniques. Learn the ropes and train like the pros at Brazilian Jiu Jitsu in Huntington Beach! We offer our students a safe and friendly environment, to ensure your ultimate success! The fundamentals curriculum at HB Ultimate Training center is 10-12 months and focuses on the core techniques that every Jiu Jitsu student must know. Focusing both on the self defense and competition side of Jiu Jitsu, this program ensures that each student gets a high quality introduction into Jiu Jitsu while allowing for more advanced students to perfect the basics. The goal of this program is the prepare the white belt to achieve their blue belt. After a strong foundation has been developed it is time to build upon it. That is where the Advanced Program comes into play. Focused on exploring Jiu Jitsu more in depth the Advanced Program is perfect for any student that has reached the Blue Belt level and is determined on achieving the goal of the Black Belt. This program will focus on learning the most modern day techniques within the Jiu Jitsu community. So, what are you waiting on? Signing up is the easiest part! To request more information, please fill out the short form on the side of this page. We will be in contact soon, and can't wait to see you on the mat.